In my experience, this beautiful flag best represents the height of exuberance and spectacular flag making during the period of the American Centennial in 1876. While medallion flags of any style are considered rare, hand sewn medallion flags with variable sized stars are rare in the extreme, with only a handful of examples known. The elongated oval medallion and the clear difference in the size of the stars makes this flag even more striking and most likely, unique. The flag was found in the Philadelphia, Pennsylvania area which is fitting, considering that Philadelphia was the site of the 1876 American Centennial Exposition. About 10 million visitors attended the Exposition, which represented about 20% of the American population at the time. 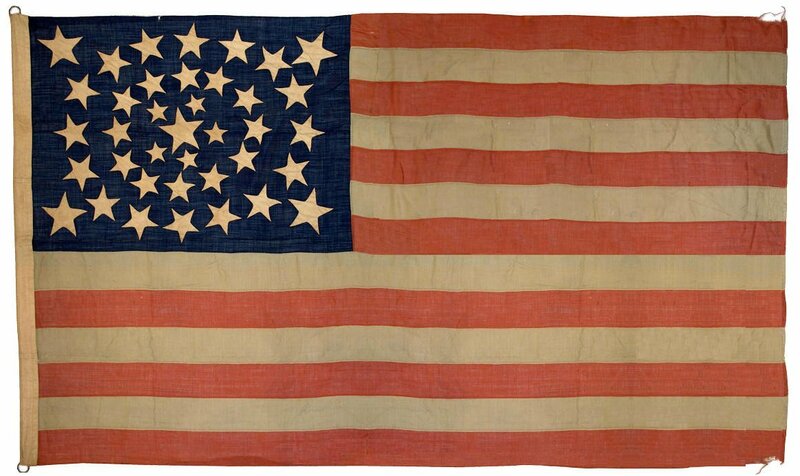 Eager to outdo themselves, flag makers of the period produced many unique star patterns in the 38 star count, with medallion style flags hitting the height of their popularity. This certainly is one of the most striking flags of the age. This flag is clearly a professionally manufactured flag, possibly made by Horstmann Brothers of Philadelphia, one of the largest military outfitters and flag makers in the country at the time. It is unusual to find a flag of this period that has entirely hand sewn stars and stripes, but this flag does. By this time, machine stitched stripes were commonplace on manufactured flags, though hand stitched stars still prevailed. With the exception of some machine stitching along the fly end of the flag, which most likely is a the result of a turn-back repair, the flag is hand stitched throughout. The wide canvas sleeve hoist holds its original rope, which has steel rings on both ends for raising the flag. The flag is in exceptional condition, with no mothing and only very little wear to the upper and lower tips of the stripes on the fly end. Except for some mellow browning of the cotton stars, it is in nearly the same condition it was in when it was manufactured over 130 years ago. It is quite possibly the only example of its kind that survives today, and is one of the most graphical and captivating flags of the American Centennial Era.